China seems to be the new home of delightful eccentricity. 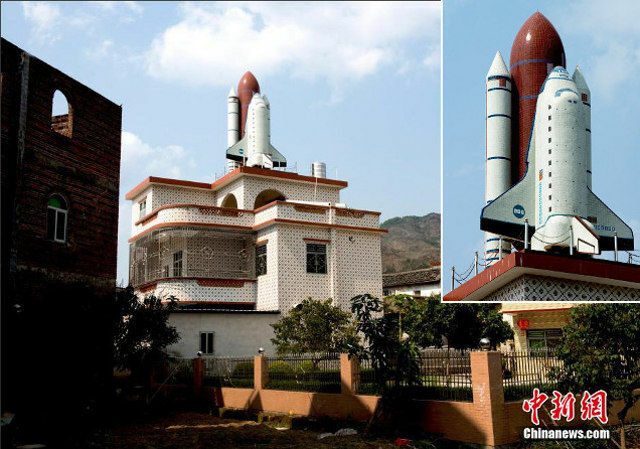 A Chinese farmer has built a space shuttle on top of his house. Meng Ni, 63 dreamed of becoming an astronaut when he was a child.But since he lived in the remote village of Xiapu, Guangdong province it was not going to happen. So instead he became a successful farmer. But he never forgot his childhood dream and eventually decided to build a life-size replica of a space shuttle on his roof. Which all seems very reasonable to me. What is money for, if not to build space ships and maybe irritate your neighbours? Apparently it offers a breathtaking view of the surrounding countryside. This entry was posted in weird news and tagged china, diy, home improvement, nasa, shuttle, space. Bookmark the permalink.